The OSCE Programme Office in Dushanbe donated technical equipment to the press center of Tajikistan’s Committee of Emergency Situations and Civil Defense (CES) at a handover ceremony that took place in Dushanbe on August 17, 2018. According to the OSCE Programme Office, the equipment will be used for broadcasting from locations where disasters occur, thus contributing to capacity building of journalists reporting on disasters, increasing the quality of coverage and preventing the spreading of inaccurate information. 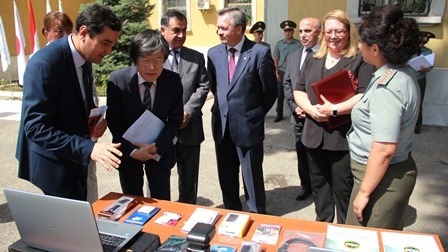 A notebook, desktop computer, digital video and photo camera, studio lighting, teleprompter and all the necessary accessories were handed over to the Committee’s press center on August 17.